For other people named John Elliott, see John Elliott (disambiguation). "Diana of the Tides" Mural by John Elliott -- Image courtesy of Smithsonian Archives. a series red-chalk drawings making up a memorial collection of the Lafayette Escadrille and other Americans who died in the First World War, currently in the National Museum of American Art, Washington. Triumph of Time,c. 1901, a two-panel mural on the ceiling of the Elliott room of the McKim Building of the Boston Public Library. The mural shows 12 female figures representing the Hours spread among twenty horses representing Christian Centuries. The horses are pulling a chariot carrying a male figure representing Time. Julia Ward Howe, 1901, red chalk drawing on gray wove paper. Given to the Metropolitan Museum of Art in 1904. Diana of the Tides, 1908, a mural in the National Museum, now the Smithsonian National Museum of Natural History. In the paleontology hall, but currently not visible due to a wall. 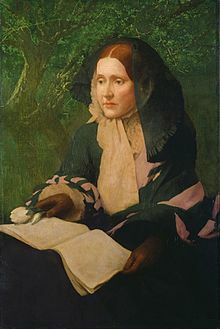 Julia Ward Howe, a portrait in oil on canvas, finished c. 1925 by William Henry Cotton after Elliott's death . On display at the National Portrait Gallery, Smithsonian Institution. Chevalier, a portrait in oil on canvas Samuel Gridley Howe as Surgeon General in the Greek War for Independence, wearing the costume of a Greek soldier. It currently hangs in the John Hay Library at Brown University. Terrace Garden, Rome, an oil painting on canvas depicting the artist's terrace at his apartment in Rome. It was painted at the request of Larz Anderson, who met his wife Isabel Weld Perkins for the first time at this location. ^ a b c Eaton, Walter Pritchard (July 1910). "The Painter of "Diana of the Tides"". Everybody's Magazine. 23 (1): 95–103. ^ Wick, Peter A. (1977). A handbook to the art and architecture of the Boston Public Library. Boston: The Associates of the Boston Public Library. p. 40. ISBN 0890730547. ^ "The Triumph of Time". A Walking Tour of the McKim Building. Boston Public Library. Retrieved 28 December 2013. ^ "Julia Ward Howe". Metropolitan Museum of Art. Retrieved 18 January 2014. ^ Ballard, Amy. "Diana of the Tides: A Sensation of Her Time". National Museum of Natural History Unearthed. Retrieved 8 June 2013. ^ "Julia Ward Howe". Catalog of American Portraits. Retrieved 8 June 2013. ^ "HOWE, SAMUEL GRIDLEY (1801-1876)". The Brown Portrait Collection. Brown University Office of the Curator. Retrieved 18 January 2014. ^ Sansum, James. "Works on Paper". James Sansum Fine and Decorative Art. Archived from the original on 28 December 2013. Retrieved 28 December 2013. ^ Elliott, Maude Howe (1930). John Elliott: The Story of an Artist. Boston: Houghton Mifflin. pp. 118–119. ISBN 1199494879. Retrieved 28 December 2013. John Elliott: The Painter of "Diana of the Tides"
Elliott, Maud Howe (1930). John Elliott: The Story of an Artist. Boston: Houghton Mifflin Company. ISBN 1199494879.